The Model 30 Moda is undoubtedly one of the coolest electric bikes on the planet. It’s futuristic styling and subtle tones make it really stand out from the crowd. It has a top specification and the 2000 watt motor powers you to a top speed of around 30mph in a few exhilarating seconds. 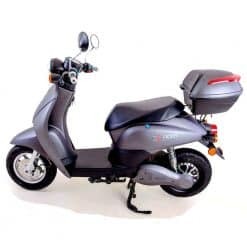 The Moda is powered by an 80 Volt lithium battery which can be removed from the bike for charging- ideal for customers without an external charging point. You can charge it anywhere- at home, at work or in a cafe. Features include LED lights front and back, regenerative braking, passenger pillion points and a reverse gear. There is a state of the art digital display and excellent storage space under the seat. The Moda is a registered vehicle and needs to be registered with DVLA. Unless they have a full licence issued before 2001 riders require an AM motorbike licence or to have undertaken CBT training. 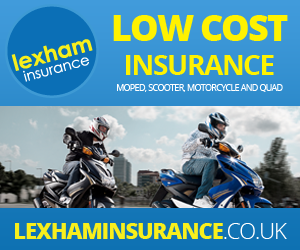 Insurance is compulsory and an approved motorcycle helmet must be worn. Road tax is free. The Moda is delivered fully assembled and ready to ride. Normal lead time is 7-10 days.